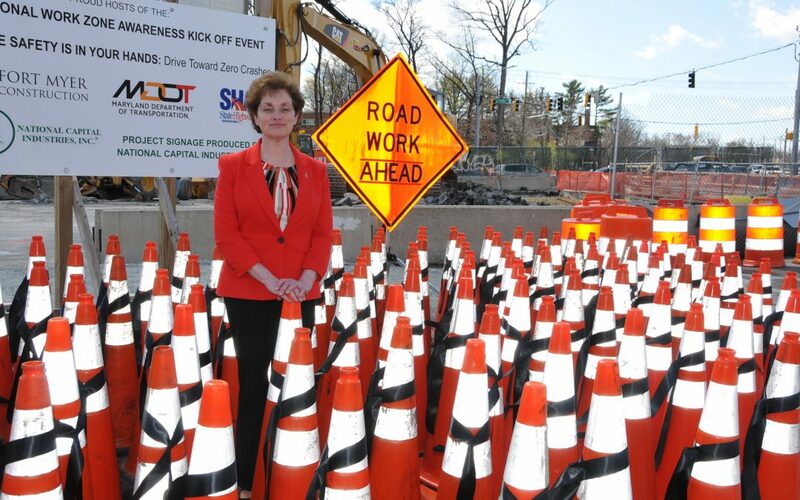 The surviving spouse of a Maryland State Highway Administration worker who was killed on the job made a direct and emotional plea to open the 18th annual National Work Zone Awareness Week, April 3-7. “To all drivers, I can’t say it enough: Work zone safety is in your hands,” said Laurie Moser, echoing the theme of this year’s safety event. Her husband, Richard, died in a June 2007 incident on U.S. 340 in Frederick, Maryland. Two of the Moser’s children, Carl and Rachael, have received ARTBA Foundation Lanford Family Highway Worker Memorial Scholarships, which provide post-high school financial assistance to the children of workers who are killed or permanently disabled in roadway construction incidents. This year’s Awareness Week theme of “Work Zone Safety Is in Your Hands” emphasizes the responsibility of all roadway users to pay careful attention when traveling through roadway work zones. This holds true every week of the year. Sadly, about 700 people, including 130 workers, are killed every year in work zone incidents. More than 35,000 other people are injured in these construction areas. Pay attention to other drivers. It’s never a good idea to ignore other drivers no matter where you’re driving, but in work zones you need to be especially mindful of them. Roadway work zones are less forgiving than normal stretches of highways and streets. They often have narrower lanes and no shoulders to escape to in case you want to take evasive action. Stay focused. Avoid distractions. Losing focus on your driving is bad in any situation, but it can prove deadly in roadway work zones. Observing what the signs tell you, controlling your speed, steering carefully, and keeping an eye on other drivers—all demand your full attention. Stop eatin Put down your mobile device. Keep your focus on your driving. Expect the unexpected. When you drive in work zones, it’s always best to prepare yourself for something unexpected, such as menacing actions by other motorists, construction vehicles that slow down to leave the roadway and pull into the work area, dump trucks that emerge from the work area and enter your lane up ahead, workers operating scant inches from your path, uneven pavement lanes, and loose gravel on the road surface to name just a few. When you anticipate problems, you are better able to react to them appropriately. Keep your cool. Be patient. Maintain Don’t get rattled by work zone situations. Always make sure your speed is appropriate to the situation— that could be slower than the posted limit. Finally, don’t lose your patience or your temper. If you keep your cool, you and everyone else will make it through the work zone and arrive safely at your destinations.